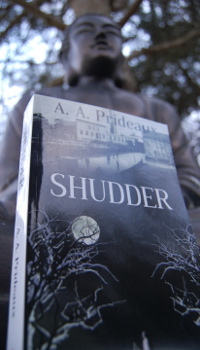 When I was writing SHUDDER, I knew about the rhubarb. I knew that many gardeners including my granddad, were good at growing it. Granddad told me tales of rhubarb plants put under cover which would creak as they grew. There was a thriving market garden industry in Old Bramley at one time and rhubarb formed a large part of it. Jam and dye were made from it and much was transported to London. I didn’t know though that my grandparents house was built on an area which once housed rhubarb forcing sheds. It is no wonder that rhubarb is such a large part of the diet of the characters in SHUDDER. I didn’t know either that there is some evidence that a tunnel used to exist under the town joining at least one of the old houses to Kirkstall Abbey, the areas having a long term mutual history. This was Old Hall, which once stood on Town Street and was eventually demolished after it had been allowed to partly fall down. Although some possible parts of the tunnel have been unearthed during building in the town, there are only old stories and letters which refer to it. I find it fascinating that my storytelling mind knew about a tunnel. Leodis has some interesting pictures of Old Hall. In the novel, I use a watercourse for part of the story, which is modernised in order to service the new apartments I learned recently that Yates Mill used an artesian well. This was drilled through the impermeable strata in order to reach water then capable of rising to the surface by internal hydro static pressure. Alan Godfrey Maps produce some fine old maps which show Bramley as it was over a 100 years ago. I would say that the maps of 1906 best represent the Bramley/Mill Town in SHUDDER.